Russia achieved more in days than the US has in years. October 21, 2015 (Maram Susli - NEO) - Russia in the few days it has been of fighting terrorism in Syria has achieved far more than the US coalition. 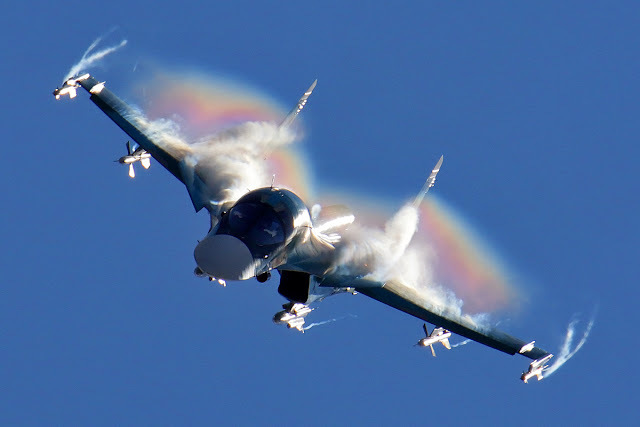 According to the New York Times, Russia’s fighter jets are conducting nearly as many strikes in a typical day as the American-led coalition has been carrying out each month this year, a number which includes strikes conducted in Iraq - not just Syria. Whilst the US has been bombing ISIS for over a year, ISIS has only grown and gained more ground in Syria. A few months ago ISIS took over the ancient city of Palmyra in Syria, a UNESCO world heritage-listed site. In spite of the fact that the US government acknowledged ISIS cannot be defeated without ground troops, they have refused to work with the Syrian military, the only force on the ground commanded by the only UN-recognized government in the country, and the only force capable and willing to fight ISIS. On the other hand Russia is coordinating with the Syrian military on the ground, assisting Syrian troops in gaining ground against terrorism. The discrepancy shows a lack of honesty on the part of the US when it comes to its real agenda in Syria vs its proclaimed goal of fighting terrorism. The US is capable of more, the US military is the most powerful and technologically advanced force in the world. It is logical to conclude that they are willfully throwing the fight against terrorism in Syria and the reasons for that should be examined. It has become clear that the US’s main objectives in Syria is not their expressed goal of ‘fighting ISIS’, but regime change, isolating Russian influence, the Balkanization and the creation of failed states. US presidential candidate and former Secretary of State Hillary Clinton herself stated that ‘removing Assad is the top priority”. The US sees the Syrian state as one of the last spheres of Russian influence beyond the borders of the former Soviet Union, and a threat to its Israeli ally in the region. The presence of ISIS and other terrorists groups serves these interests. The US has a history of using terrorism to topple governments friendly to Russia. Al Qaeda itself was borne of the US objective to topple the Soviet friendly government of Afghanistan. The dismemberment of Russian-friendly Serbia and the creation of Kosovo was done via the same means. More recently ISIS was a direct result of the US’s intervention in Iraq, and have only arrived in Libya and Syria in the wake of overt US-backed regime change efforts there. Although Libya and Iraq did not have relations with Russia as strong as Syria’s, Russia was still their main weapons supplier. It is therefore not surprising that since Russia entered the war in Syria, Saudi clerics and the Muslim Brotherhood - both US state assets - declared 'jihad' on Russia. The former Defence Intelligence Agency (DIA) Chief Michael Flynn said in an interview that he believed the US had made a willful decision to allow ISIS to grow in Syria. A 2012 declassified DIA report, wrote if the US and its allies continued to destabilize Syria by arming extremist insurgents “there is the possibility of establishing a declared or undeclared Salafist principality in eastern Syria… and this is exactly what the supporting powers to the opposition want, in order to isolate the Syrian regime." ...the CIA has since 2013 trained some 10,000 rebels to fight Assad’s forces. Those groups have made significant progress against strongholds of the Alawites, Assad’s sect. On the other hand Russia has clear geopolitical interests behind defending the Syrian state against terrorism. Syria has been an ally of Russia for decades, and it hosts Russia’s only Mediterranean naval base. Russian Foreign Minister Lavrov stated that Russia is entering Syria to prevent ‘another Libyan scenario,’ or in other words - to prevent it from turning into a failed state as the US had done to Libya. Furthermore Russian interests in fighting terrorism are tied directly to Russia's own national security. Russia has had problems in the past with terrorism within their own borders and in particular, Chechnya. Chechen fighters who have joined ISIS in Syria, have now threatened to take the fight to Moscow. Jabhat Al Nusra, Syria’s Al Qaeda faction, have also called for terror attacks in Russia. In an interview with 60 minutes, Russia’s President Vladimir Putin stated that it is better to fight terrorists in Syria than wait until they return to Russia. Terrorism poses far greater risks to Russia’s national security than it does to the US. Not only is their proximity closer, but terrorists in Russia have the potential to cleave off part of the state and overrun entire Russian towns. This is not the case for the US, whose only risk to national security would be civilian deaths due to bombings, and that is not necessarily something that the US government would find a real 'problem,' and in fact, might even see as a possible opportunity. ...we need to find partners that we can work with in Syria to help us contain ISIS. So it is a difficult problem to figure out the best strategy. I agree, they have safe haven there in parts of Syria and that will have to be part of the strategy for containing ISIS. I think we are containing ISIS within the borders of Iraq and Syria. Outside of that we're not doing much. ...continue to shrink ISIL's sphere of influence, its effectiveness, its financing, its military capabilities to the point where it is a manageable problem. Should we defeat ISIS? Rather than defeat, containing their activities within failed or near-failing states is the best option for the foreseeable future. The US bombing of ISIS has been mostly nominal, an exercise in perception management. Although the US Defense Intelligence Agency makes regular claims to have bombed specific targets, rarely is video evidence of the bombing strikes published. On the other hand the Russian military regularly releases video of most of the strikes on Russia Today. It was also leaked that the US had forbade its fighter jets from targeting a long list of ISIS training camps, which turn out thousands of fighters a month. Award winning journalist Robert Fisk told the Australian program Lateline that the US could have bombed a convoy of ISIS militants who were taking over Palmyra, but instead allowed them to take over a Syrian military post as well as the ancient City which they have now begun to destroy. When the US has dropped bombs on ISIS run territory they have used the opportunity to primarily destroy Syria's oil infrastructure. Likewise the US has largely avoided bombing ISIS and Al Qaeda targets in the Syrian district of North Hama in an attempt to prevent Syrian troops from gaining ground. Russia is now striking these targets long the benefactors of US-granted impunity. Perhaps the most ironic development of Russia’s involvement in Syria’s fight against terror, is the anger expressed by the US government and its media at Russia’s bombing of Al Qaeda (Jabhat Al Nusra) targets. Former US National Security Adviser Zbigniew Brzezinski, the man largely responsible for the creation of Al Qaeda, expressed his frustration with the fact that Russia was targeting Al Qaeda as well as ISIS through his twitter account. Pro-NATO media has all but forgotten its war with Al Qaeda, and avoids any mention of its existence preferring to concentrate on ISIS instead. They have especially tried to avoid bringing to light the fact that Russia is bombing Al Qaeda in Syria where the US has largely avoided doing so including Homs, Hama, Idlib, and around Aleppo. In the same CNN article which accuses Russia of not targeting ISIS but rather‘Syrian rebels”, two maps displayed from the Institute for the Study of War shows a very telling story. The first shows the areas in which Jabhat al Nusra controls or jointly controls with its allies - the so called moderate rebels receiving US-backing - but on a map showing locations of Russian strikes, Jabhat al Nusra territory can scarcely be seen, obstructed by highly concentrated Russian strikes - in other words - it is finally being wiped out of these areas. The map further illustrates how US-backed ‘moderate rebels’ working alongside Al Qaeda has become such common knowledge. In the past, commanders of rebel groups labeled 'moderate' by the US government have fought alongside ISIS, and reiterated their support of ISIS in satellite news interviews. Recently "moderate rebels" from the so-called "Free Syrian Army" Division 16 joined Al Nusra in their attacks against the Kurdish city of Sheikh Maqsud in Aleppo. Pro-NATO media has even been reduced to calling the rebels ‘relatively moderate’. Relative to Al Qaeda and ISIS? In any case, 'moderate' has always been a relative term, unlike the word secular which is the US run media dares not use to describe the US backed insurgency. Last week the US abandoned a Pentagon program to train rebels to fight ISIS, after all but five defected to Al Qaeda taking their weapons and training with them. 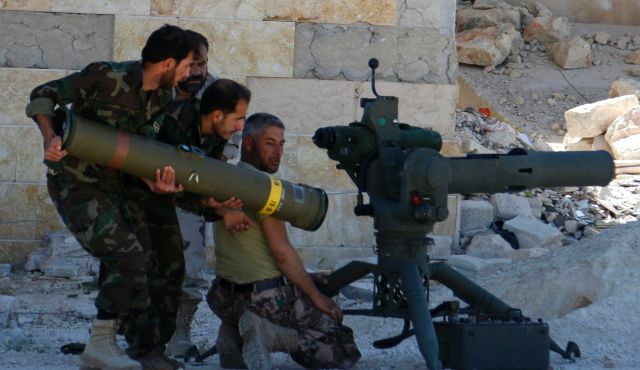 Past attempts by the US to arm ‘vetted rebels’ has resulted in TOW anti-tank missiles ending up in the hands of Al Qaeda. But instead of admitting to the fact that ‘moderate rebels’ do not exist and ceasing the illegal armament of extremist insurgents, the US government has instead chosen to openly back “established rebel groups” who have close ties to Al Qaeda. The US is now sending yet another shipment of TOW missiles to these extremist groups through its ally Saudi Arabia. Al Qaeda is not the only terrorist group the US has been accused of arming. This month, footage filmed by the Iraqi military of an oil refinery that had been captured by ISIS, shows US supply crates full of food and weapons having been delivered to Islamic State militants by parachute. 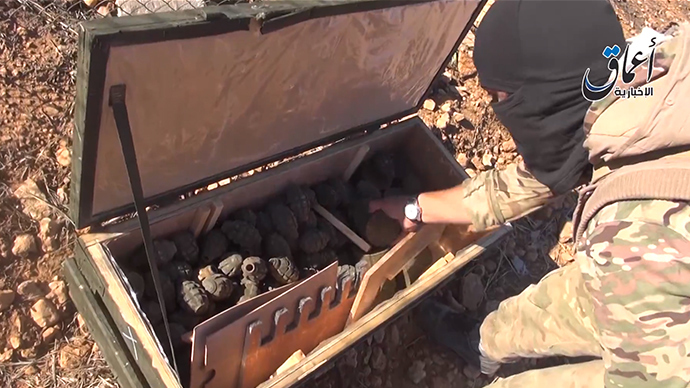 In 2014, footage of another US supply drop to ISIS in Kobane Syria also emerged online. Only a few days ago the US airdropped 50 tons of ammunition into Hasake region of Syria, where there has been a lot of ISIS activity. Most of the weaponry used by ISIS is US made. In January this year, an Iraqi MP Majid al-Ghraoui publically accused the US of supplying ISIS with weapons through airdrops. The Iraqi government has become increasingly suspicious of the US’ lack of real commitment in fighting ISIS. On the other hand, Russian strikes have thus far been so effective against ISIS that the Iraqi government has asked Russia to take on a bigger role against ISIS than the US. Russia has in turn signaled that it may start bombing ISIS in Iraq as well as Syria, with the permission of the Iraqi government. Unlike the US, Russia has not broken international law and has sought permission to enter Iraq and Syria from each respective state's legitimate government. With these actions Russia has called the US’ bluff on fighting ISIS, and is effectively forcing the US to do a better job of convincing the Iraqi government that it is truly fighting ISIS. If Russia does enter Iraqi airspace, it will more easily cross into Syrian airspace to provide supplies to the Syrian government, since the US has bullied many countries in the region to close their airspace to Russian aircraft. Furthermore, if Iraq asks Russia to enter, it is a scenario that would reverse any of the influence the US had gained in Iraq throughout its lengthy occupation of the country since 2003. The US has been backed into a corner, and in doing so, has exposed itself and its allies as the source of terrorism, not champions truly fighting it. Terrorism has always been a means by which the US has sought to deconstruct Russian spheres of influences. Ironically over the last decade it has also simultaneously perpetuated the myth that it is actually fighting a war against terror. However as its allied states grow increasingly tired of this game, how long can the US continue to juggle this duplicity, before the entire deck of cards crumbles? Maram Susli also known as “Syrian Girl,” is an activist-journalist and social commentator covering Syria and the wider topic of geopolitics. Especially for the online magazine“New Eastern Outlook”.